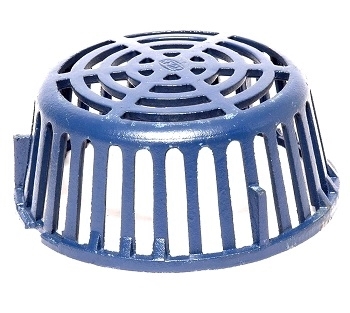 PRODUCT: 10 inch OD x 4-3/8 inch High Cast Iron Low Profile Replacement Drain Dome. ZURN #56587. fits ZURN Z121/Z111 12 inch drains. Blue Dura Coated finish. Price/Each. 3/8 inch ID 316 Stainless Steel Flat Washer (fits 3/8 bolts), SAE Type, 13/32 ID, 13/16 OD, 0.0625 Thick. Price/Each. 3/8-16 x 1 inch Hex Washer Head (HWH) Bolt, Marine Grade 316 Stainless Steel, 1/2 inch Head Head, ASME B1.1 UNC Right Hand Threaded, Meets ASME B18.2.1. Price/Each. ZURN #56588 Clamp Collar / Drain Ring, Cast Iron, 4-bolt, 11.25 OD. Fits Z121 12 inch Drains. Price/Each. ZURN Z121 12 in. Roof Drain, Low Profile 4-3/8 in. High Dura-Coated Cast Iron Dome, Dura-Coated Cast Iron Body, Gravel Guard/Clamp, No-Hub 2 in. Outlet. Price/Each. Zurn Z121 12 in. Roof Drain, Low Profile 4-3/8 in. High Dura-Coated Cast Iron Dome, Dura-Coated Cast Iron Body, Gravel Guard/Clamp, No-Hub 3 in. Outlet. Price/Each. ZURN Z121 12 in. Roof Drain, Low Profile 4-3/8 in. High Dura-Coated Cast Iron Dome, Dura-Coated Cast Iron Body, Gravel Guard/Clamp, No-Hub 4 in. Outlet. Price/Each. ZURN Z121 12 in. Roof Drain, Low Profile 4-3/8 in. High Dura-Coated Cast Iron Dome, Dura-Coated Cast Iron Body, Gravel Guard/Clamp, No-Hub 6 in. Outlet. Price/Each.